LGBT history is missing from most narratives, so the National Park Service aims to fix that. 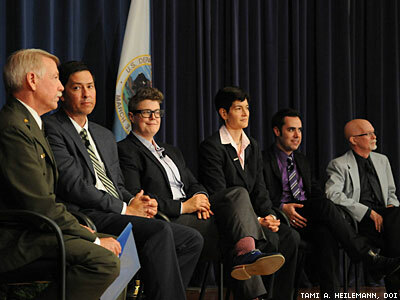 A national TV audience, hundreds of people in a packed auditorium, and dozens of media representatives watched last week as National Park Service director Jon Jarvis launched a groundbreaking LGBT Heritage Theme Study at the Department of the Interior. With funding from the Gill Foundation, Jarvis and his colleagues had assembled a delegation of scholars to ensure that the contributions of LGBT people to our country’s history are represented in the ways the National Park Service interprets its parks and historic properties for the public. Sitting onstage listening to Jarvis’s remarks, I flashed back to a day in 1997 when I worked as a historical tour guide while pursuing a Ph.D in U.S. history from Columbia University. On one hot summer day I was assigned to guide a busload of Mormon Boy Scouts from Idaho through New York City. As we approached Christopher Street that afternoon, it had already been a long day. The bus driver had expressed disgust and contempt when he realized I was not actually the “nice young man” he initially perceived me to be. I had a fierce internal dialogue going about whether I could forgive myself if I just skipped the story of the Stonewall Inn and avoided any further hassle. Then one cheeky scout asked me if there were “a lot of bisexuals in New York City,” nudging his friend with a sneer. A chaperone quickly piped up, “That question should only be answered on a need-to-know basis!” Laughter rippled through the bus. Looking at the group, I thought of my younger self. Figuring that more than one person in that group, statistically, “needed to know,” and that none of them should be allowed to opt out of the reality of LGBT existence, I proceeded to give them an all-LGBT perspective on New York City from Christopher Street to Midtown. No tip. No parting handshakes. No regrets. But if that one scout had not asked, and had I not been ready to answer, that busload of boys could have gone through the Village and learned nothing of the central story of LGBT resistance and the cultures and people that are profoundly part of the American story. Unfortunately, stories of LGBT people and events are not just missing from our National Park Service. They are still largely absent from history books used in K-12 classrooms. The Gay, Lesbian, and Straight Education Network’s 2011 National School Climate Survey of LGBT students found that more than 83 percent of them had never been exposed to positive representations of LGBT people, history, or events at school, and fewer than half could find any information about LGBT issues or history in their school library. Educators will tell you how important it is that curriculum serves as both a window and a mirror for students, reflecting their own experience and strengthening their understanding of the lives of others. Absence and exclusion damage the individual sense of self and the communal understanding of reality. Silence equals death, indeed. Three years after that group of Mormon Boy Scouts learned about the riots credited with launching the modern-day LGBT rights movement, the National Park Service designated the Stonewall Inn a National Historic Landmark — the very first and still the only site on that list specifically related to LGBT history. A plaque went up. What happened here is officially important, it declares, to all of us. That stop on the tour is no longer optional. We cannot allow LGBT history to be pushed back into the closet and withheld from students any longer. There must be more plaques. Youth everywhere need to see that LGBT lives matter, that our presence in this country has made a difference, and that we are part of the national narrative. Because of this new National Park Service initiative, our stories will be told in New York City and elsewhere, in all of the communities nationwide where we have lived, and loved, and rebelled against our exclusion, in all of the places where LGBT Americans have made their mark on our communities. The National Park Service will tell our stories on behalf of the nation. Because these are things that every American needs to know. ELIZA BYARD is the executive director of the Gay, Lesbian, and Straight Education Network and holds a Ph.D in U.S. history from Columbia University. GLSEN champions LGBT causes in K-12 schools and advocates for the inclusion of LGBT people, history, and events in K-12 curricula. Learn more at www.glsen.org.